The Modulair Max by 3M is a high capacity airline trolley system providing air for up to 4 simultaneous users. 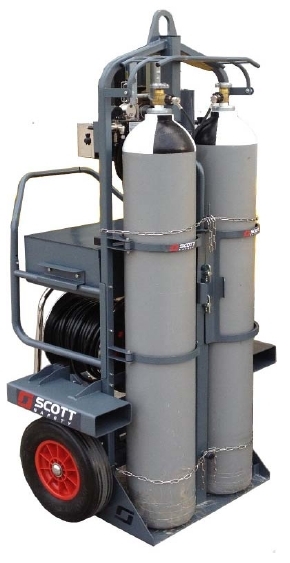 The unit is approved to supply air with lengths of airline hose measuring up to 105 meters. Built to be compatible with the 2 x 45 liter cylinders and giving 24,500 liters of air or the 2 x 50 liter cylinders and giving 27,000 liters of air, the system is capable of supplying in excess a 10 man hours of breathing air. The standard unit is fitted with a hose reel, 4 man pneumatics, 2 position cylinder valve guards, telescopic support struts, a lifting eye allowing the unit to be hoisted by a crane and a 3rd wheel for support whilst moving the trolley. Options include AFU for filtering the external air supply, a DS4 electronic low air alarm to signal if that external air supply is failing and forklift brackets to enable easy loading of the unit. A storage box that is lockable is also available that will take tools or an airline BA set and can be easily fitted to the Modulair Max unit.